FiloAlfa, a company specialized in 3D filaments production, boasts a product catalog of excellent quality and high performance materials. 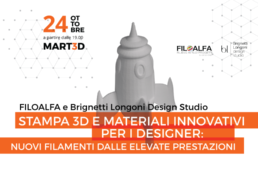 During the evening, they will feature some new high-performance filaments made for an audience with specific technical needs, such as Brignetti and Longoni Design Studio, who use 3D printing and new technologies in their design and found in FiloAlfa is a point of reference when it comes to choosing innovative materials that can expand their scope. An evening of presentation, but also of stories and comparisons between the exponents of two fields that are not so far apart.